Jio is offering three sachet packs priced at Rs 19, Rs 52 and Rs 98. Airtel has prepaid recharge plans priced at Rs 59 and Rs 93. The telecom price war is far from ending. Telecom operators like Reliance Jio and Bharti Airtel are coming up with new prepaid recharge plans in order to maintain their subscribers' base. 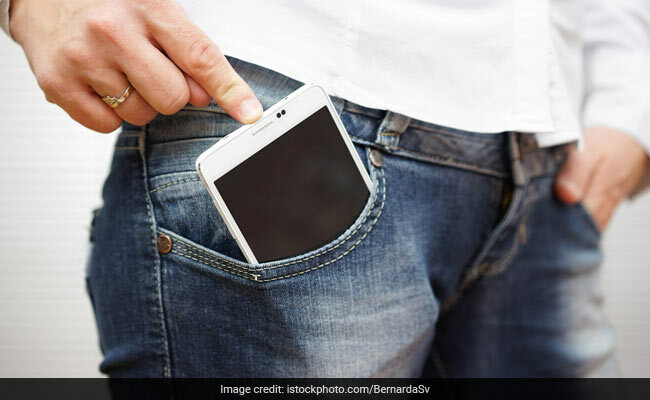 Apart from offering heavy data plans, both the telecom biggies are also offering prepaid recharge plans under Rs 100 for users looking for plans offering less data. Jio is offering three sachet packs priced at Rs 19, Rs 52 and Rs 98. 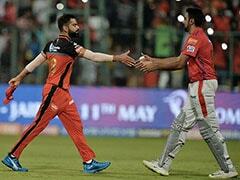 While Airtel has prepaid recharge plans priced at Rs 59 and Rs 93. Reliance Jio's Rs. 19 sachet pack offers 0.15GB of high speed 4G data, after which the internet speed gets reduced to 64 Kbps, said Jio. This pack of Jio comes with free and unlimited local, STD and roaming voice calls. Jio's sachet pack of Rs 19 also offers 20 free SMSes. The validity of this pack is 1 day. Reliance Jio's Rs 52 sachet pack offers 1.05GB of high speed 4G data for the validity period with a daily cap of 0.15GB data, after which the internet speed gets reduced to 64 Kbps. This pack of Jio comes with free and unlimited local, STD and roaming voice calls. 70 free SMSes (short message service) are bundled along with this sachet pack. The validity of this pack is 7 days. 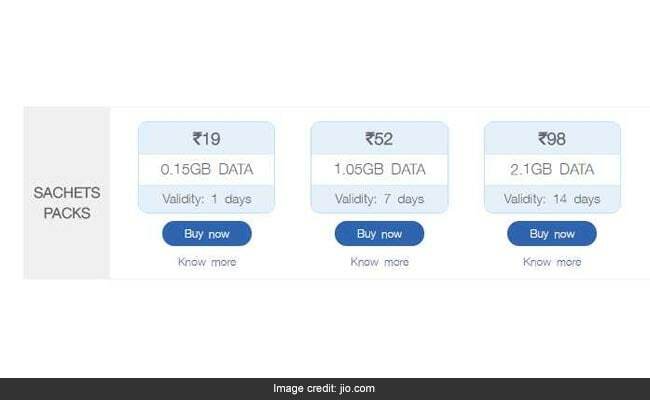 Reliance Jio's Rs 98 sachet pack offers 2.1GB of high speed 4G data for the validity period with a daily cap of 0.15GB data, after which the internet speed gets reduced to 64 Kbps. This pack of Jio comes with free and unlimited local, STD and roaming voice calls. 140 free SMSes (short message service) are bundled along with this sachet pack. The validity of this pack is 14 days. 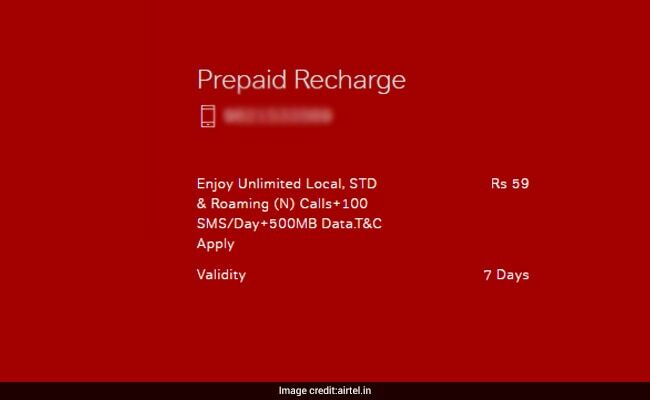 Airtel's entry-level prepaid recharge plan priced at Rs 59 offers 500 MB of 3G/4G for a period of 7 days. There is no daily limit on data in this prepaid plan introduced by Airtel. Airtel's Rs 59 prepaid recharge plan also offers free and unlimited local, STD and roaming calls. This prepaid plan doesn't come with any bundled SMSes and is available only on select circles. Subscribers willing to recharge with this plan can check the availability of the plan via My Airtel app. 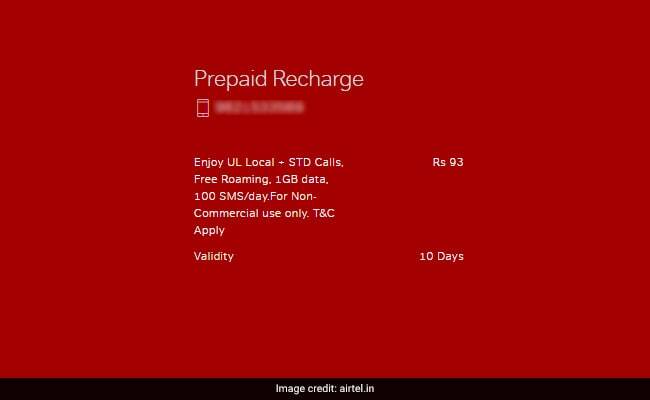 Airtel's Rs 93 prepaid recharge plan comes with no daily data cap, and has an upper limit of 1GB data for 10 days. It also gives users unlimited local, STD and roaming calls and 100 SMSes per day. The validity of the plan is 10 days.